Hermit crabs are social creatures who thrive if you re-create their natural habitat correctly. 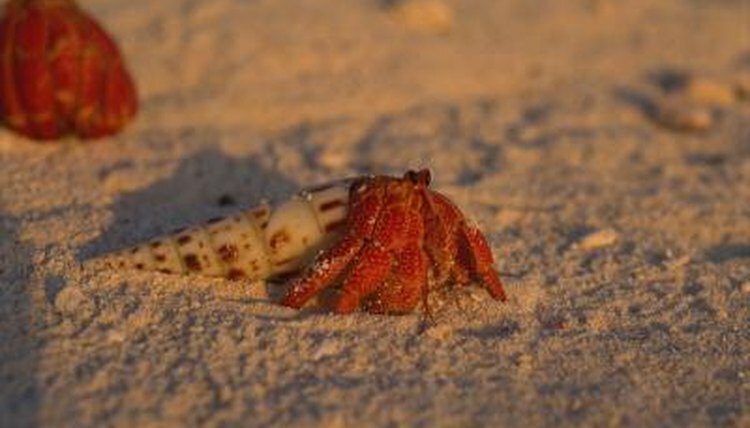 In an imperfect environment, a number of stress factors can adversely affect a hermit crab. Limb loss and isolation are not just the results of stress -- sometimes they're symptoms. A hermit crab can lose his limbs for a number of reasons, including shell fights with other crabs, injury and stress. When a hermit crab loses a limb to stress, the limb separates from his body at the base. If he loses more than one limb in the span of a few hours, then he will likely not survive. However, if he loses just one or two limbs, even one of his pincers, he might make it. When a hermit crab is stressed to the point of losing limbs he will isolate himself from other hermit crabs in his tank. It is best to isolate him if he doesn't do so himself in a separate tank under the necessary conditions his habitat demands, so he can be comfortable and not feel the need to compete with other crabs for food. Some people mistake the loss of limbs for the molting process. Molting is when your hermit crab has outgrown its exoskeleton and sheds it – not when it loses limbs. A hermit crab becomes stressed if you do not accurately recreate his habitat. Check your pet’s tank to ensure it is not dirty and the humidity is not too low. His drinking water should be free of chlorine. Temperature fluctuations will stress out a hermit crab, as will extreme temperatures, so make sure the tank is neither too hot nor too cold. Heat lamps and heat rocks may be to blame, as could the lack of places for him to burrow or hide. He could be lonely – hermit crabs are social creatures so he might need a friend or three. Bathing or misting your hermit crab too often could also be stressing him out. Even if your hermit crab has lost a limb or two due to stress, his condition might get better if you address the issues that caused him stress. Once you provide your stressed-out hermit crab a stress-free environment, you will have to wait to see whether the stress was lethal or not. Some crabs who lose a leg or a claw survive and regenerate the lost limbs when they molt. When a hermit crab loses more than one limb in the span of just a few hours, the crab is likely near death. Even if you remove potential stress factors, he may not survive. If this is the situation, isolate him from other hermit crabs, and keep him as comfortable as possible until he dies.